Other commitments have thwarted my hopes on at least a couple of other occasions to hear Stile Antico at the Wigmore Hall. Having heard excellent things about the group, I was not to be disappointed in this concert of music not necessarily written for Holy Week, though some of it certainly was, yet eminently suited to performance at a time of Lenten penitence. Though the Arts and Crafts cupola above the stage is secular in theme – the Soul of Music gazing upwards to the Genius of Harmony – it often seems to me to have something of the sanctuary to it. On this occasion, it almost seemed as if a little of Westminster Cathedral or indeed the chapel at my present college, Royal Holloway, University of London, had come to Wigmore Street, and very welcome that imaginary visitation was too. As one of the winning, informative spoken introductions mentioned, boundaries between domestic and church music were often blurred during this period. That was not just the case for recusants; conforming congregations would often like to perform music at home, though naturally not every congregant would have the musical ability to sing Byrd and Tallis. At any rate, a nice balance was struck, a balance that varied according to the work, between ‘domestic’ intimacy and a fuller, rich sound heard when all twelve members of Stile Antico sang. The starkest contrast in that respect would be when Byrd’s Attend mine humble prayer, granted just three solo voices, was followed by the full complement of a dozen for Tallis’s Miserere nostri. Variation in forces never, however, precluded continuity in performance; it was accomplished with minimal fuss, unlike some of those concerts in which rearrangement seems almost to take as long as performance itself. Byrd’s Miserere mei offered pleasingly full, rich sound to open with. Anachronistic though it may be to describe this as ‘Anglican’ music, it has certainly become so, Byrd proving not just a staple but a highpoint of music lists for ‘quires and places where they sing’. It was not long before I almost imagined I could see the candles of Evensong, taken back to my undergraduate days in which the mixed choir of Jesus College, Cambridge, benefited from an organ scholar with particular enthusiasm for Byrd (and equally creditably, a particular lack of enthusiasm for the more meretricious fringes of the nineteenth-century repertory). Tallis followed, with the first Salvator mundi from the 1575 Cantiones sacrae, jointly published by him and Byrd. Tone was plangent without being puritanical. The music was permitted to speak, as it were, ‘for itself’, but not in the occasionally bland fashion that can emerge from groups who treasure purity a little too much and stress the words not quite enough. Dissonances were not exaggerated – a common failing in the opposite direction – but were felt in tandem with the text beseeching the redeeming Saviour of the world for succour. In a sense, they tantalised all the more for that, rather than being presented as faux Gesualdo. Relative simplicity was offered in Morley’s Nolo mortem peccatoris, but the painful meaning was clear throughout, the Latin burden offering carefully judged contrast of hope with the English verse of ‘painful smart’. As so often, the alto line offered especially piquant suffering – I certainly do not mean that pejoratively! – in Tallis’s Absterge Domine. The request that God remember His good will – ‘bonae voluntatis’ – seemed to receive subtle emphasis, a sign at least of hope. Robert White’s Lamentations received a fuller, more choral rendition, following the four single voices allotted Tallis’s Purge me, O Lord, though clarity remained paramount. An unhurried performance proved attentive in equal measure to music and text. In the face of such an imploring setting, less overtly so than the soon-to-come seconda prattica of Monteverdi and the nascent Baroque, but subtly apparent nonetheless, how could the words ‘Hierusalem, convertere ad Dominum Deum tuum’ (‘Jerusalem, turn to the Lord thy God’) not be heeded? Serenity, again skilfully avoiding the aforementioned snare of blandness, was to be heard in Byrd’s Emendemus in melius. The harmonic spice of Tallis’s In jejunio et fletu was well judged, not least on account of the fine balance struck once again between verbal and musical expression. Three solo voices might be a difficult texture, but it did not sound so, whether in work or performance, in Byrd’s effortlessly negotiated – at least apparently so – Attend mine humble prayer. Tallis’s Miserere nostri was taken with glorious breadth – and yet, to take an apocryphal quotation out of context, it moved. John Sheppard’s Haste thee o God may have been ‘older’, but this piece from the reign of Edward VI, did not necessarily sound so; indeed, its (deceptive) simplicity in some senses at least looked forward as much as back. Byrd’s masterly Infelix ego received a fine performance in conclusion, Janus-faced, harking back to the rich heritage of the votive antiphon and forward-looking in its more ‘modern’, text-focused quality. Above all, it benefited from a keen sense of overarching form, not as something containing, let alone constricting, but as liberating framework for expression. It is difficult not to wish that such a glorious piece of music, every inch the equal of England’s greatest later composers such as Purcell and Birtwistle, might go on forever, but in its ultimate finitude, whatever its undeniable expansiveness, there lies a Lenten message too. For a fitting encore, we returned to Tallis: an exquisitely blended performance of O sacrum convivium. Eloise Nancie Gynn’s Anahata was the latest work to receive its first performance in the LSO Panufnik Young Composers Scheme. The best, alas, that could be said about it was that it was competently enough orchestrated, if relying far too heavily upon ‘eastern’ colour: bowed vibraphone, Tibetan singing bowl, and so forth. (Edward Said might never have existed.) Otherwise, the piece sounded akin to the sort of soundtrack one might hear on an average television programme: a few ‘effects’, which might have gravitated some meaning in conjunction with an external narrative, but with apparently zero musical justification. Tonal harmonies sounded rather more than shop-soiled. The work, one read, was ‘inspired by my [Gynn’s] exploration of spirituality through meditation. Finding a way through life and its obstacles and emotions; a journey inside, from the head and all its mental chaos, thoughts and “stuff” ... into the stillness of the heart space, connecting to the peace within.’ I could go on quoting; on second thoughts, I am not sure that my stomach could withstand the effort. Nicholas Collon and the LSO seemed to give the piece a far more authoritative performance than it deserved. No matter; I doubt we shall hear it again. I certainly cannot imagine that we shall hear it again in the company of the otherwise well-suited pair of Schubert and Brahms. Manfred Honeck, deputising for Sir Colin Davis, led a performance that for the most part convinced, though it sometimes went a little overboard in its pursuit of extremities, whether of tempo or of dynamic contrast. The opening cellos sounded dark, mysterious, yet controlled: just right. Perhaps the basic tempo adopted was on the fast side, but it soon yielded – arguably too much. Still, better to enjoy flexibility than Kapellmeister-ish straitjacket. Cultivated playing from the LSO alternated with furious eruption. It was the beauty of the softest playing, however, which ultimately lingered longest in the memory. Moreover, one certainly heard a good few of the harmonic seeds for Brahms, preparing the way for the second half. This was a musical landscape whose breadth tempted one to think of Bruckner, albeit with greater incident. Unwanted applause ensued. For the most part, the second movement flowed beautifully. ‘Beauty’, however, proved to be a slight problem, for however exquisite the opening of the second group sounded – and it certainly did – it sounded a little too much like an object of appreciation rather than a participant in a musical, indeed above all a harmonic, drama. It undoubtedly offered contrast with the outburst that followed, but the contrast seemed too much: an easy way out, however impressively controlled. That said, it was impossible not to warm to the echt-Viennese quality of Schubert’s Harmoniemusik: not just its exquisite tonal quality, for which the LSO players stood beyond praise, not only on account of its timbral differentiation, but also for its communication of the menace within the ‘heavenly’ material. With a stronger sense of continuity, this might have been a great performance. It is probably a good thing that I do not possess the vocabulary to describe those who applauded before the final chord had ceased to resound. Nikolaj Znaider joined the orchestra for Brahms’s Violin Concerto. The orchestra showed typically impressive symphonic heft in the opening, Znaider offering in response winningly-old fashioned silken sweetness, not that he lacked cleanness and precision. (Let us pass over the problematic cadenza.) Honeck proved an attentive ‘accompanist’, perhaps a little too much so, clearly following Znaider’s tempo fluctuations rather than emerging as an equal partner. As a whole, there was much to enjoy, but there is something a little amiss when Brahms sounds more ‘enjoyable’ than profound; I could not help but long for Menuhin and Furtwängler, or perhaps even Znaider and Sir Colin. The slow movement offered ravishingly beautiful woodwind playing, and not only from Fabien Thouand’s exquisitely turned oboe solo; once again, Vienna and even Mozart came to mind. When Znaider entered, he creditably sounded as first among equals rather than dominating soloist. With a flowing, uncontroversial tempo, this sounded as Brahms closer to Mendelssohn than to Schoenberg, but there is nothing wrong with that once in a while. The finale, however, proved somewhat awkward, a state of affairs that seemed more Honeck’s doing than Znaider’s. The ‘Hungarian’ rhythm of the principal theme was shaped with fine understanding, its rhythmic accent spot on. Alas, the music soon began to meander, for which Honeck appeared to over-compensate by bringing out an excessive, almost Tchaikovsky-like, array of primary colours as ‘interest’. Such vulgarity has no place in Brahms. An exciting occasion in many respects, not only in terms of this concert itself, but also the weekend it opened, ‘It’s all about Piano!’ subtitled, ‘a festival celebrating all forms of piano,’ hosted by the Institut français du Royaume-Uni in South Kensington. There is an embarrassment of riches, including recitals by Imogen Cooper (Schubert) and Cyprien Katsaris, a duo recital from Katya Apekisheva and Charles Owen (including the four-hands version of The Rite of Spring), a ‘Cabinet of Curiosities’ series (just one of which, performed by Antoine Alerini, offers Maurice Ohana, Félix Ibarrondo, Stockhausen, and Jonathan Harvey), and film (including the world premiere showing of a filmed version of Poulenc’s La Voix humaine from Felicity Lott and Graham Johnson). For further details, please click here. It is certainly to be hoped that so enterprising a festival will become a regular feature of London’s musical life; I only wish that I had been able to attend more events myself. Nick van Bloss offered a scintillating account of one of the very peaks of the piano literature, the fourth part of Bach’s Clavier-Übung, as we never call it, or the Aria with diverse variations, as we equally seldom call it, commonly known as the Goldberg Variations. Composed ‘to refresh ... [the] spirits’ of ‘music lovers’, it certainly did so here. Indeed, I had to marvel that something like an hour and a quarter had passed, for I could happily have listened to work – and performance – immediately again. There will always be a multitude of ways in which this work may be performed, even if we leave aside – with relief – the non-question concerning the instrument. Sir Thomas Beecham's celebrated description made the harpsichord sound more interesting than it is; those of us without antiquarian fetishes welcome the modern piano with open arms and ears. There was certainly no question that van Bloss was willing to exploit the modern instrument to the full, Bach's two manual 'effects' transferring with added brilliance and bravura to the Steinway. Not that anything was merely ‘pianistic’ for its own sake; indeed, the overriding impression was, however ideologically loaded these terms may be, was of a masterpiece of ‘absolute music’. There was not the slightest temptation to read anything programmatic into work or performance; the canvas of Bach’s musical imagination was more than enough for us to grapple with. For who would ever dare to think that he had somehow finally ‘understood’ this work in its entirety? At best one comes a little closer, ‘at best’ requiring an excellent performance such as this. Van Bloss’s approach was not to adopt, still less to impose, a unifying æsthetic. Unity instead arose out of diversity, out of those ‘diverse variations’. Even when there were instances when I might have cavilled, for instance a couple of very ‘dry’, almost defiantly non-lingering, conclusions to particular variations, the point was immediately clear, and made fine retrospective sense in terms of preparation for the following variation. (I should probably add in this connection that, whilst the Ciné lumière undoubtedly offered an intimate performing space, its acoustic must also have presented a challenge, here skilfully surmounted.) Whilst tone was fuller, more piano-oriented, than anything one would be likely to hear in, say, Glenn Gould’s recordings, some variations enjoyed a more clipped and rhythmically strict performance, whereas others, not least Wanda Landowska’s ‘black pearl’, the 25th, looked forward – or should that be back? – to the Romantic period that so adored and rejuvenated Bach’s music. Though the shift is not straightforwardly linear by any means, the general developmental impulse within the score toward greater complexity, if only in cumulative terms, registered clearly and convincingly. The Quodlibet was as limpid, and yet as contrapuntally meaningful, as what one would hear from Murray Perahia. Finally, the Aria da capo sounded just as it should, a return to the beginning, yet anything but. Bach’s material was transformed by the very act of performance as well as by his own extraordinary powers of musical transformation. Near-unanimous approval tends to make me suspicious. However I might have tried, though – and, to be honest, I did not try very hard – I found myself unable to dissent. If George Benjamin’s new opera, Written on Skin, does not necessarily knock one for six, sixty even, in the way that a Birtwistle opera would, such is not Benjamin’s subtler – not superior, just different – way. The Mask of Orpheus and Gawain, for instance, make a cataclysmic impression akin to one’s first Wagner; in a sense, Benjamin requires closer, more attentive listening, not unlike that necessitated by Pelléas et Mélisande, and, just as important, readiness to consider what opera might be, what it might do, where it might yet take us. (Not, I hasten to add, that Birtwistle does not benefit greatly from the most attentive listening, but one might entirely miss the point of Benjamin without it.) Insofar as one can possibly feel emboldened to use the word after a single hearing, Written on Skin is a masterpiece. Perhaps most intriguingly, it seems to mark more of a beginning, Benjamin’s chamber opera Into the Little Hill notwithstanding, than a culmination. It may be the latter too, in that in retrospect, much of Benjamin’s œuvre seems to have been heading in this direction, but the opportunities opened up seem greater still. Martin Crimp’s libretto derives inspiration from a thirteenth-century Occitan ballad, though no more than Benjamin’s music does it attempt any manner of pastiche. The story, at least on one level, is dealt with easily. A landowner, The Protector invites The Boy into his house and household to write an illustrated book, to be written on skin, a book that would chronicle and celebrate a good life and good deeds. Initially suspicious, the Protector’s Wife – his ‘property’, as he tells us – falls both for book and Boy, their combination a liberation for her, in a sense an instantiation of personhood. They become lovers, as documented by the Boy in his book. Though attracted to the Boy himself, the Protector kills him and serves Agnès a meal that includes the Boy’s heart. What is intended as revenge, as a way to subordinate her once again, provokes defiance, for Agnès is able to declare that the taste of the Boy’s heart will never leave her mouth. She frustrates her husband’s attempt to kill her by taking her own life. So far so good, but in many ways, what most interests are the framing and the questioning. An opening Chorus of Angels takes the audience back eight centuries and bring to life the Protector and Agnès; one of them takes on the role of the Boy. The angels intervene and comment, drawing a parallel with Biblical Creation: man is invented and punished; woman is invented and blamed. Who provokes the dreams of the Protector, in which he learns of a secret page to the book, Agnès depicted therein ‘gripping the Boy in a secret bed’? There are many other such questions one might and should ask, but they are perhaps to be subsumed within the striking realisation that writing itself is at the heart of the drama. Fate in the guise of the pitiless angels is strong, but narrative formulations in which the protagonists speak of themselves in the third person present not only a degree of artificiality – ‘naïve’ art, in Schiller’s celebrated formulation, being no longer possible – but compel the audience to write and to interrogate its own dramas. We are involved in something old, strange, and yet new; at the same time, we are both of the Angels’ party and repelled by it. Benjamin’s music, is of course instrumental – in more than one sense – in accomplishing that too, if never straightforwardly. The fifteen scenes may in some sense be considered ‘cinematic’ but they are still more of the theatre. But before coming to that, let us consider Katie Mitchell’s staging. The thing with ‘one size fits all’ metatheatricality is that, not unlike a stopped clock, from time to time it fits. And given the horror of her ENO Idomeneo, it is a matter of gratitude that Mitchell did not on this occasion try something different. I cannot in all honesty say that I perceived a particular need for the extras to be doing what they were doing rather than something else, at least for much of the time, but that, I think, was the point. A sense of something ongoing, indifferent to mere human concerns, angels as bureaucrats, one might say, came across so strongly for the very reason that Mitchell had paid such attention to apparently irrelevant – though who is to say? – detail. Action proceeding on different levels, physical as well as otherwise, here assists the story or stories, Vicki Mortimer’s contrasting ‘old’ and ‘new’ designs assisting equally in that respect. I shall limit my remarks concerning Benjamin’s music, remarks which must necessarily remain generalised; I have only heard it once and have not seen the score. Nevetherless, even from a single hearing, it not only accomplished a necessary union of intellectual and emotional involvement; it enticed one to hear the work again and again. Sonorities old and new beguile, though it is worth reiterating that there is nothing of the pastiche even, indeed especially, to the use of an ‘old’ instrument such as the bass viol. Its Passion resonances may be unavoidable, but what most strikes is its apparent contemporaneity, to the action, to us, to wherever or whenever we might be. Likewise the use towards the end of glass harmonica might initially have one think ‘Mozart’, but what it does has apparently little to do with those strange miniature masterpieces Mozart composed under very particular circumstances. The ethereal quality remains, to be sure, but almost takes on an electronic- or, perhaps better, post-electronic quality, seducing our ears, expanding their range, hinting even at sounds we have yet to perceive. Stockhausen may seem quite distant, and in most senses he is, yet perhaps his ghost in that sense haunts. Perhaps more striking still, however, are the use not of ‘unusual’ sounds, but of the orchestra as commonly understood and indeed of post-tonal – use what adjective one will – harmonic relations. One hears references, conscious or otherwise, above all to Pelléas and to Wozzeck – I was delighted to see Benjamin mention both works in a programme interview, having reached that conclusion for myself – but it is only occasionally, for instance in a Wozzeck-like set of intervals, that one can say for certain, and even when one can, it is admirably unclear what that might mean, if anything. The understatedness must surely have some inspiration in Pelléas, the only non-Benjamin opera the composer has conducted, making one listen, drawing one in, preparing the way for the moments of cataclysm, which register with power all the greater. The pacing and drawing of climax suggests, no embodies, a mastery of musico-dramatic composition to rank with some of the greatest. Vocal writing is grateful, yet again makes no deluded references to styles no longer possible. About an hour and a half, moreover, proves once again a wise length for an opera. There are great operas that last for much longer, of course, operas from which one would rather slit one’s throat rather than have a single bar cut from them. However, one thinks more often of brevity in terms of its lack than its excess. (I vigorously, even furiously, dissent, but I have even heard people talk of longueurs in Elektra.) Janáček tends to have it just about right; so does Berg in Wozzeck. Wagner never fails in that respect – well, perhaps in Rienzi, though we should do well to grant ‘Meyerbeer’s greatest opera’ the opportunity to be heard ‘in full’, whatever that might be. Yet, as everyone knows, Wagner offers the most dangerous of models. Mozart and Monteverdi are similarly unapproachable, perhaps still more so. It is far better, then, to have an informed audience wondering whether there might have been room for a little more expansiveness than to have it constantly checking its watches. Performances were excellent. I assume Christopher Purves to have been a little under the weather, since so fine a singer would not normally have had recurring problems at the top of his range. Dramatic truth shone through nevertheless; it was at the time of hearing – and I do not mean this in a restrictive fashion – impossible to imagine anyone else in his role of Protector. Bejun Mehta and Barbara Hannigan both proved sensational as the Boy and Agnès. By now, at this stage on the production’s tour, this must almost be a repertoire work for them, but their combination of musical and dramatic intelligence felt as keen as I imagine it might have done at the premiere. Ethereal beauty, sensuous allure, and an inscrutable blend of apparent naïveté and knowingness marked Mehta’s Boy. Hannigan’s musico-dramatic excellence, her journey from subservience through sexual liberation to mastery – a deliberately gendered choice of word – over her husband were charted equally by stage presence, vocal line, and communication of the text. Victoria Simmonds and Allan Clayton offered admirable support as angels and as Agnès’s sister and brother-in-law. Last yet anything but least, the performance of the Orchestra of the Royal Opera House was breathtaking, not least in the sense that one had to remind oneself after the event that this was ‘new music’. Benjamin’s score was performed with both special, loving attention, every phrase sounding apparently as it should – again, I should stress, there is a degree of supposition here, without actually seeing it for myself – and the whole despatched as if, in the best sense, this were staple operatic fare. By that, I mean not to say that there was the slightest hint of routine, but rather that the confidence to express and indeed to seduce was paramount. If such playing did not convince, convert, then it is difficult to know what would. It really is past time, then, to smash the museum, a museum all the more constraining – as any good Feuerbachian will tell you – because its alienation is imaginary. Opera houses – all of them, certainly not just Covent Garden – devote an inordinate amount of time to works of little consequence, endlessly repeated, for no other apparent reason than that historically they have formed part of the repertoire. What, then, sells out? Written on Skin and The Minotaur. Whenever one speaks to opera-goers – as opposed, doubtless, to people who attend ‘the opera’ as a social occasion – they thirst for new repertoire and for modernist classics, many of them unstaged in whichever house, city, even country one is considering. Would anyone really care if another note of Donizetti were never heard again? Many of us would be relieved. In any case, surely it is about time that Nono, Henze, Stockhausen, Busoni, Dallapiccola, Schoenberg, even Haydn and Gluck, had a chance, still more so composers who – cue a deep intake of breath – have the temerity still to be alive. What people talk about, care about, are willing even to travel across the globe for, are great reimaginings of repertoire masterworks – Parsifal from Gatti and Herheim, for instance – revivals of unjustly neglected masterworks – take the Theater an der Wien’s recent Mathis der Maler – and great contemporary musical drama. Opportunities to hear the nth high C may be relegated to the circus. Boulez, from whom we still of course await an opera, once spoke of his admiration for the Red Guard, since it was willing to destroy; if audiences are to renew themselves, it will be through works such as those of Benjamin, Birtwistle, et al., works which themselves renew the operatic form to which so many of us are devoted. Still, Kasper Holten’s new regime seems to be offering something of a new dawn for the Royal Opera; the recently announced 2013-14 season an undoubted improvement upon what has gone before. Contrasts with the artistic near-nullity on offer next year in Paris and Vienna is stark. Let us hope, then, that this splendid achievement will be built upon and that never again shall we hear that a new production of a wonderful opera such as Weber’s Oberon – hardly an avant-gardist work! – has been cancelled in order to make room for the third run within a single season of La traviata. If one’s reaction to a great opera performance, whether it be a newly-minted Figaro under Sir Colin Davis or a genuinely new work, is to wish to hear it again immediately, then that is what we need to feel about opera seasons as a whole. Let us toast, then, the Royal Opera’s plans to place new opera at the very heart of what it does, of what it is, of what it will be. Wagner’s attempts to have his first completed opera staged were to no avail; the interested reader may consult his autobiography, Mein Leben, for his own account. Eventually staged in Munich in 1888, five years after the composer’s death, it would not be staged in Britain until 1969, under the auspices of the Midland Music Makers Grand Opera Society. The Chelsea Opera Group, as is its custom, gave the work in concert, though I shall be fortunate enough to see Die Feen staged next month in Leipzig. It is a splendid work, far from perfect and at times immature, but far superior to a number of works, and indeed entire œuvres that continue, bafflingly, to hold the stages of many opera houses. For the Wagnerite, and indeed for those with any interest at all in musical history, there is considerable additional pleasure to be derived from the parlour game of identifying both the many influences upon the work and the ways in which it offers a true starting point for Wagner’s subsequent explorations. While I had written [the incomplete, preceding] Die Hochzeit without operatic embellishments and treated the material in the darkest vein, this time I festooned the subject with the most manifold variety: beside the principal pair of lovers I depicted a more ordinary couple and even introduced a coarse and comical third pair, which belonged to the operatic convention of servants and ladies’ maids. As to the poetic diction and the verses themselves, I was almost intentionally careless about them. I was not nourishing my former hopes of making a name as a poet; I had really become a ‘musician’ and a ‘composer’ and wanted simply to write a decent libretto, for I now realised nobody else could do this for me, inasmuch as an opera book is something unique unto itself and cannot be easily brought off by poets and literati. And so of course, it would continue, Wagner writing all of his own musico-dramatic texts, even though in this instance he reworks – should that not be too modest a verb – Carlo Gozzi. One may trace a multitude other continuities or presentiments, not least the idea of the forbidden question, albeit the other way round from Lohengrin, at least in terms of gender, Ada, the half-fairy, half-mortal, having agreed to marry Arindal, the King of Tramond, with the condition that he never ask her who she is. Die Feen, however, is no tragedy, for, after inevitably having asked the question, had Ada disappear, and followed here to the underworld, where, Orpheus-like (a tribute to Wagner’s beloved Gluck? ), he restored her to life with voice and lyre, Arindal gains immortality and joins Ada in the land of the fairies. Immortality would, of course, become a curse or chimera to the later, Feuerbachian Wagner: think of Wotan. Here, however, the trials he must undergo both recall The Magic Flute and presage Die Frau ohne Schatten. That is not, of course, to say that Die Feen itself is a crucial link between Mozart and Strauss, though Wagner certainly is, but rather to remind oneself that so many of the ideas on which German and indeed other dramatists draw are part of common currency, not least that of the resolutely unsentimental fairy tale, as in the present case. And then, there is Arindal’s hallucinatory Wild Hunt, which cannot but make one think of Gurrelieder. I could go on and on about the ‘dramatic’ content, but ought at least briefly to say something in similar vein, if equally selective, about the music. For instance, there is a second-act figure that naggingly anticipates Tristan, and the choral writing certainly at times looks forward to Tannhäuser and Lohengrin. Looking back, Weber, Marschner, and only slightly less, Beethoven, Mendelssohn, and Schumann loom large in the general music language, this being a more unalloyed ‘German’ opera than either of its two immediate successors, Das Liebesverbot and Rienzi, though the Italian and French influences upon those works have often been exaggerated. But in any case, the broader point is that, for Wagner at this time, standing firmly in a dominant tradition of eighteenth-century German æsthetics, perhaps the key to understanding ‘German art’ was its power of synthesis, overcoming merely ‘national’ styles to progress, in his later Zurich ‘reform’ language, toward the universal. Sadly, this performance was let down severely by the orchestra. Whilst it may not yet possess the Greek choral role of Wagner’s mature music dramas, it is nevertheless fundamental to the drama as a whole. Here, however, the players proved for the most part quite unequal to Wagner’s exacting demands. The first act suffered most, the strings in particular often painful to listen to, each desk apparently playing according to its own unique and highly variable system of temperament. Rhythm was little more of a strong point; indeed, at one point, Dominic Wheeler had to re-start proceedings, a wise split-second decision, which one did not envy him. In the circumstances, his direction of proceedings was not bad at all, though it could not be said that he boasted any especial insights. Ideally this music requires the advocacy of a great Wagner conductor, though very few have deigned to perform it, the late Wolfgang Sawallisch an honourable exception. Still, it seemed as though whatever Wheeler said to the orchestra, or at least to the strings, during the first interval paid off somewhat, for horrors were fewer as the work progressed. However, some truly dreadful woodwind and horn playing marred the beginning of the third act. At least the choral singing, whilst sometimes a little fuzzy and underpowered, stuck for the most part to the right words and notes. There was a degree of tentativeness to some of the solo singing too, again most obviously in the first act, where one sometimes had the impression of relatively early rehearsal run-through. I later had it on good authority, however, that the soloists only received their scores two weeks prior to the performance; if that be true, one may appreciate their predicament, and deplore the situation. If there were often, though by no means always, a sense that greater familiarity with the score would have been of considerable assistance, there were no especially weak links in purely vocal terms. The smaller roles were in general well taken, Mark Stone impressive as the courtier, Morald, and Piotr Lempa splendidly stentorian in the small roles of the Voice of Groma the magician and the Fairy King; I should not be surprised to hear him in the future as a big-stage Commendatore, even a Fafner. Kirstin Sharpin’s Ada improved appreciably as the performance progressed; if vocal strength is intermittent at the moment, it is nevertheless present and will doubtless develop. Elisabeth Meister’s voice and dramatic presence are already the real thing; hers was undoubtedly the star turn of the evening. Not only did her voice stand head and shoulders above the others during ensembles, her dramatic commitment as Lora, Arindal’s sister, could be sensed and indeed seen throughout. At his best, David Danholt offered a tenor of impressive heft and no little tenderness. There were, however, times when he seemed a little uncertain and when his contribution petered out, perhaps out of tiredness. Better than nothing, then, especially when nothing is what we have had for far too long. However, a rarity, even when its rarity-value is so thoroughly undeserved, often needs particularly talented advocacy, which in this case was at best fitful. Perhaps, in these circumstances, the cuts were not entirely ill-advised. I hope readers will forgive me if I make this review relatively brief, the reason being that events outside the control of the performers, or indeed the hall, made it rather difficult to come to a conventional judgement concerning the performance. A good part of the second part fell under the shadow of an audience member apparently losing consciousness, collapsing, and receiving medical treatment, most of that going on, immediately next to my seat, whilst the performance continued. I mention that not to over-dramatise, and certainly not in any sense to complain, my thoughts being very much with the man concerned, but simply to explain why inevitably, I am not in the best position to go into great detail. This was the first time I had heard the Aurora Orchestra in Baroque repertoire, though I have had quite a bit of Mozart from them and from Nicholas Collon. The swift tempo for the great opening chorus had me worried, as did the relative reticence of the strings, but my fears were confounded; tempi were, at least by present-day standards, remarkably unobjectionable, and more than that well-chosen. Nor was there for the most part a lack of flexibility such as one all too often hears now in this repertoire. The orchestra was very small (strings 4.4.3.2.1) – though doubtless the ayatollahs of one-to-a-part ‘authenticity’ would dissent – but Hall One at Kings Place is not a large space, and for the most part, it was only in making mental comparisons with great recorded performances such as those by Gunther Ramin, Eugen Jochum, and Richter that one keenly felt the loss. Likewise, though warmer string tone would at times have been desirable, there was commendably little of the hair-shirt to the performance. I am having to rely on the evidence of my ears, but it sounded to me as though some at least, perhaps all, of the violins were employing gut strings. Vibrato was mercifully not absent – a noteworthy feature in our Alice in Wonderland world of Bach performance. The woodwind were especially fine, every obbligato solo assumed with excellence of technique and feeling. Oliver Coates’s cello stood out from the continuo group and indeed as a superlative obbligato instrument. The Choir of Clare College, Cambridge, offered fine performances, by turn angry and devotional, as text and role required. The turba choruses were vivid, the chorales heartfelt but clear-eyed. Diction, moreover, was thoroughly excellent. The tiny part of the Maid, taken by one of the choir members, was unfortunate in intonation, but otherwise there was little about which anyone might reasonably complain. John Mark Ainsley occasionally took his Evangelist to the limit of what might be desirably in terms of hectoring, but there was no doubting his commitment and understanding and, so long as one did not insist upon the mellifluous tones of an Ernst Haefliger, much by which to be moved. Roland Wood’s Christus was less individual, but well delivered, and that may indeed have been the point. He is not, after all, a ‘character’ in the conventional sense. All of the other soloists shone, Malin Christensson striking a fine balance between an almost operatic beauty of tone and attention to the text, likewise Iestyn Davies, the ‘operatic’ quality of whose outburst in the extraordinary ‘Es ist vollbracht!’ could hardly have been more arresting. (If I still find a counter-tenor more apt for Handel than Bach, still preferring the warmth of a mezzo or contralto, then that is arguably just a personal matter.) Andrew Tortise offered plangency and, again, detailed attention to the text, whilst David Stout’s baritone suggested a consolation consonant with that offered by the Aurora woodwind. That, then, is indicative of my experience, compromised though it was by events. It certainly augurs well for a December Aurora/Clare Mass in B minor. I wish, however, that the Kings Place website had not described the work as ‘Bach’s iconic St John Passion’. It is surely now time that that much-abused word be proscribed until further notice, if only so that it might regain a little meaning. Seven movements and seven last words: I wonder whether that was the initial stimulus behind this programme. It does not necessarily reveal very much in itself – the extent to which Beethoven’s op.131 is in seven true movements is at least debatable – but, more importantly, prefacing the serenity of Haydn’s most extraordinary work for string quartet with that of late Beethoven had one both thinking and feeling, in a sense the essence of religion, in this case of Lenten religion. The passionate fragility of fugal entries at the opening of Beethoven’s Adagio ma non troppo e molto espressivo sounded almost timeless, as if evoking not only Bach but even Palestrina, kinship with the Missa solemnis apparent without unnecessary underlining. Alleged purity of counterpoint may be a chimera, an ideological construct even, yet it seemed for a moment at least instantiated in the Belcea Quartet’s performance. Dynamic contrasts were ideally shaped by the harmonic ebb and flow, and vice versa. For all the austerity, humane Romanticism shone through: no hair-shirt non vibrato here. If the transition to the second movement were slightly blurred, momentum was soon regained, its D major tonality – up a semitone – sounding bright yet celestial. The third movement, itself essentially transitional though at the same time far more than a ‘mere’ transition, was handled with great care for its structural status and therefore broader meaning, preparing the way for a slow movement that was beautiful and rarefied, even if at times one might have wished for greater earthiness. Its third variation, however, offered a properly titanic mental struggle, almost a microcosm of the quartet as a whole. The scherzo rightly sounded as if the music were close to breaking point; indeed, it might readily have been taken further still along that road. Still, kinetic energy and splintering both physical and metaphysical were readily apparent. Austerity and humanity, however foreshortened, marked the transitional Adagio, quasi un poco andante, after which the vehemence of the finale, almost at times as angry as if this were Beethoven in early C minor rather than C-sharp minor mode, reinstated sonata form more defiantly than triumphantly. Moments of sweetness, of great tenderness, found their place in an intensely dramatic account. Haydn’s Seven Last Words were presented interspersed with readings by Thomas Quasthoff. Whether they were Quasthoff’s own choice, I do not know, but they were arrestingly selected from Hölderlin, Novalis, Fouqué, Heine, Tieck, Rückert, and Eichendorff, and arrestingly delivered, the anger in Hölderlin’s Die Ehrsucht, for instance, followed by a consoling voice in Novalis’s Es gibt so bange Zeiten (the first Haydn sonata coming in between). There is of course no work remotely like this in Haydn’s œuvre or indeed anyone else’s, the singularity being not just a matter of a sequence of slow movements, not just of liturgical context, but also of Haydn’s musical response, his symphonic inspiration – the ‘original’ version was, after all, written for orchestra – yet filtered through tendencies, at least, of Baroque Affekt. Whilst written beautifully for string quartet in this arrangement, the music does not often sound like a typical Haydn quartet; nor should it. The Belcea Quartet’s responses seemed very well to understand the unusual qualities of this work. In tandem with Quasthoff, our concentration was held throughout, without the slightest fear that almost unrelieved ‘slow music’ might have one’s attention wander. Echoes – or should that more properly be foreshadowings? – of Mozart were heard in the Introduzione. The players’ unanimity was impressive, and almost liturgically significant, in those extraordinary opening bars, Maestoso e adagio indeed. The ‘purely’ musical beauty of Haydn’s instrumental development told its own story and yet, at the same time, those of the Cross and of Hölderlin’s preceding Geh unter, schöne Sonne. The first sonata, placed as previously stated between Hölderlin and Novalis, offered a beauty that again approached that of Mozart, albeit with a variety of the plain-spoken unmistakeably Haydn’s own. Echoes of Haydn’s Stabat Mater informed, knowingly or otherwise, its successor: Amen dico tibi: hodie mecum eris in paradiso, a truly paradisiacal prospect before us, its developmental ecstasy quite overwhelming in my case. The tenderness of the Grave sonata (‘Woman, behold thy son!’) and the placing of Christ’s despair (Eli, Eli, lama asabthani) between Heine’s shipwrecked man (Der Schiffbrüchige) and an excerpt from Tieck’s novel, William Lovell, proved almost as moving, prior to the simple sublimity of the fifth sonata, Sitio (‘I thirst’). Corina Belcea’s first violin, moving quietly above pizzicato strings, met with vehement, indeed passionate response: agonising and yet not without consolation. Haydn’s response to the terrible words Consummatum est! proved searing, yet classically so, and all the more movingly so for that, likewise the surety of faith, without a trace of bitterness, in Christ’s subsequent commending himself into the hands of his Father. The plight of a world left behind – at least until Easter – made for a desolate earthquake. And still they come, not that I am complaining in the slightest! London has certainly not done badly for stagings of Eugene Onegin recently, and it did not do badly here either; indeed, it, or rather the performers, did very well indeed. Most of the operas I have seen at the Royal Academy of Music have been smaller scale; so far as I can recall, the only other nineteenth-century work was Béatriceet Bénédict, which of course is, by Berlioz’s standards, rather an intimate work. One might say the same of Eugene Onegin; after all, these ‘scenes’ from Pushkin were first performed at the Moscow Conservatory. But there is nevertheless a grander, for want of a better word ‘Romantic’, face to the work too – and there is ballet, or at least dance. However, any fears that a nineteenth-century opera might be biting off more than the RAM could chew were firmly banished. Not everything was perfect, of course, but then I could say the same about any other performance I have heard. The orchestra took a while to get into its stride, noticeably more confident after the first interval. There were a good few brass fluffs early on; moreover, there were times when, with the best will in the world and even in a small theatre, the strings (6.6.4.4.2) were simply too thin in tone. That said, what was perhaps rather more surprising was how, especially as time went on, a glowing Romantic tone was more fully achieved. Jane Glover ably shaped the musical action throughout, displaying flexibility and not inconsiderable passion, without neglecting the needs of her young singers. (In ‘normal’ circumstances, I have little patience with the idea of a conductor ‘supporting’ singers, which normally seems to mean holding back, but in a music school environment, matters are somewhat different.) I do not mean this to be faint praise, but Glover’s account of the score was infinitely preferable to the recent dismal showing by RobinTicciati at the Royal Opera House. John Ramster’s production did not provoke a great deal of thought, as Kasper Holten’s excellent ROH staging certainly had. (It clearly, unsurprisingly, passed over a great number of people’s heads, though seemed perfectly clear to me.) For a ‘traditional’ staging, however, it does its job well enough, granting the cast the opportunity not only to don nineteenth-century apparel but also successfully to follow commendably detailed stage direction. I was somewhat puzzled by what looked rather like a crown of thorns above the stage prior to St Petersburg; however, I realised, upon its disappearance, that it had been nothing so conceptually provocative, merely an indication of the countryside. There is nevertheless one particular directorial intervention at the end of the second act: following the death of Lensky, we see a calculating Olga already having moved on to the Captain from Mme Larina’s party. Victoria Newlyn’s choreography is apt and well executed, a credit both to her and to the cast. Not least of the difficulties for the singers would have been the task of singing in Russian. (Thank goodness it was not translated!) They must all have been very well coached – Glover credited Ludmilla Andrew both for coaching and transliteration – since the results ranged from good to excellent. Perhaps Tereza Gevorgyan, the Armenian Tatiana, had an inbuilt advantage, but that did not explain her well-nigh superlative assumption of the role more generally, especially later on. Hesitance was well conveyed in stage terms during the opening scene, but the greatest triumph was in her final scene with Onegin, when a rare degree of agency was forged, making it clear that an empowered woman had turned the tables on the man who had once rejected a girl from the country. The slight – and I mean slight – metallic edge to Gevorgyan’s voice worked splendidly in cutting through and soaring above the orchestra; I hope and expect to hear more from her. Rozanna Madylus’s Filipievna, though of course a far smaller role, was at least as impressive, a full assumption, visually as well as vocally convincing, such as would have graced a major house. There was also much to admire in Anna Harvey's eminently professional Mme Larina. Fiona Mackay’s Olga occasionally lacked depth of tone, but was well acted, indeed exuberantly so, and for the most part equally well sung. I wondered during the first act whether the relative stiffness of Ross Ramgobin’s Onegin was deliberate or a matter of nerves. By the end of the opera, I was reasonably certain that it had been the former, for he charted an excellent dramatic course, clearly transformed by the fatal duel with Lensky. (Not for the first time, I could not help but wish that more had been made by the director of the men’s ‘romantic friendship’, a subtext so glaring that it verges upon a supertext; however, Ramster’s production was unlikely to be the place where that would happen, and so it proved.) Vocal confidence grew as the performance continued: a highly creditable performance in a difficult role. Stephen Aviss’s Lensky suffered a little by comparison. I had the impression that it was a directorial decision to stress the airs of a poet, to render them slightly ridiculous, rather than the character’s brooding Romanticism, but there might nevertheless have been greater inwardness in performance too. Stuart Jackson verily stole the show, or rather the second act, as a bumptious M Triquet. Even Zaretsky made his mark, in the excellent hands of Samuel Pantcheff, making one wish the part were more extended. Prince Gremin is a gift of a role to an established bass, but whilst sung well by Nicholas Crawley, presents a greater challenge to a younger voice, a challenge whose deepest notes were not fully surmounted. Choral singing was excellent throughout; heft, clarity, and linguistic skill were equally impressive, no mean feat in this opera. The Schubert Ensemble, celebrating its thirtieth anniversary, presented as the culmination of its Kings Place celebrations, a programme comprising eight of the forty-five works it has commissioned, one of which, Edward Rushton’s Piano Quartet, received its world premiere. All eight works received performances of which both players and composers should have been proud; indeed, all but one of the composers, John Woolrich – well, two, if we count one Johann Sebastian Bach – were present in the audience to hear for themselves. Huw Watkins’s Piano Quartet, premiered at last year’s Spitalfields Festival, emerged as a predictably accomplished single-movement work. Well-crafted and somewhat elegiac in character, its motivic design and working were audibly apparent throughout, doubtless a facet of performance as well as work. I was put in mind of (neo-)Prokofiev at times, though without a second hearing or – preferably – a viewing of the score, I am not sure that I could claim that to be more than a personal correspondence drawn. Joe Cutler’s Slippery Music, first performed at the Cheltenham Festival, opened arrestingly, that opening dominated by often high-lying violin, here played with especial verve by Simon Blendis, and piano. The piece struck me as a highly imaginative – and successfully so – employment of the apparently classical formation of the piano quartet, to heightened ‘dramatic’ ends, yet without an obvious ‘programme’. Even knocking on the wood of the instruments was integrated, not a mere ‘effect’. Edward Rushton’s Piano Removal 2, also for piano quartet, was more overtly programmatic, its five parts corresponding to the shipping of Robert Louis Stevenson’s piano from Edinburgh to the island of Upolu. The first part, with pounding pianoforte and ‘raucous’ – the composer’s word – strings was perhaps the most noteworthy, at least on a first hearing. If I found myself a little underwhelmed by Rushton’s piece – such is generally the nature of such new music ‘compilation’ programmes – then Bach chorales, courtesy of John Woolrich, delighted, the ensemble now completed by the arrival of double bassist Peter Buckoke. Not for the first time I found myself lamenting how, in these days of ultra-authenticke puritanism, often the only way we are permitted to hear Bach on modern instruments is in transcription, but that is an issue for another day. Woolrich’s often dark reimagination, not unlike that of Ulysses Awakes for Monteverdi, proves faithful and unfaithful, as any true Bach performance should. Tones of Bach’s piano concertos seemed subliminally present in performance, whilst his harmonic genius both shines through in itself and inspires his collaborator(s). Pavel Zemek Novák’s Unisono takes material from various members of the Bach family and presents it in unison, but in some ways transformed rhythmically as well as texturally. If ultimately it does not seem to amount to a great deal more than the sum of its parts, it does not overstay its welcome, and made for a welcome divertissement. For David Knotts’s Night Song and Garden Quadrille, we lost our pianist. The composer’s programme description opened, ‘I wanted to write a piece which focused on Judy Kleinman’s love of gardening,’ surely the only time that sentence has been formed, whether musically or otherwise. The reference was to Daniel Kleinman’s commission for the birthday of his wife, Judy. The dancing quality of the music indeed seemed matched by its sense of the outdoors, not a wild Romantic landscape, but the manageable, familiar yet always fascinating, world of the garden. David Matthews’s Tango, piano regained, followed in similar vein, an arrangement of the fourth movement of Matthews’s Fourth Symphony. If it seemed more of an occasional work than anything more substantial, there will doubtless always be a call for the former. Martin Butler’s American Rounds, by contrast, sounded over-extended: fine if sub-Copland Americana is your thing, but with apparently little else to engage. It was performed with considerable brilliance, though, and much of the audience seemed to love it. What a wonderful surprise this turned out to be! Whilst your reviewer would be more likely to tire even of Tristan than of Figaro, he approached this evening in somewhat jaded fashion. Had the experience of once again teaching this term’s ‘Mozart’s Operas’ undergraduate course led him ever so slightly to take an opera whose perfection yields only to that of Così fan tutte? At any rate, this sparking performance, from an engaging cast of young singers, in – for once – an appropriately sized theatre came as a tonic. Not everything was perfect, of course, but it proved as a whole a superior experience to a number I have experienced in the most celebrated of houses. 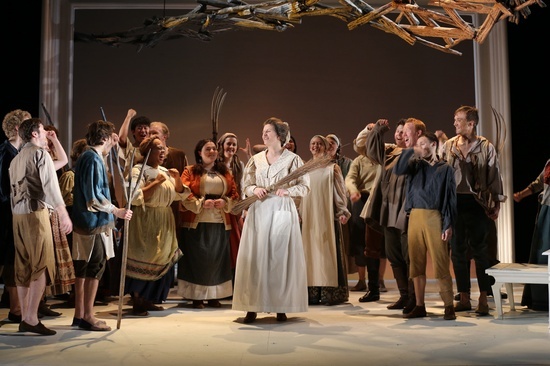 I was initially sceptical concerning Martin Lloyd-Evans’s staging, which relocates the action to a present-day American electoral campaign, Almaviva the candidate, in what, judging by the hint of ‘local colour’ from the chorus – a slightly questionably ‘Occidentalist’ touch, I thought – might perhaps have been New Mexico. The Overture depicts illegal immigration, the Count included, suggesting hypocrisy in the ‘two years later’ Republican hard line upon his successors. That all might sound rather remote from the concerns of Figaro – and it is really. But it is little more ultimately than a framing device, permitting the action proper to take place within a hotel campaign headquarters, making some sense of the subservient staff roles allotted to Figaro, Susanna, et al. Less jars than one might expect; the droit de seigneur does not take so very much transformation into workplace harassment. The richness of an eighteenth-century society of orders is lost, of course – how commonplace a late-capitalist hierarchy of money and politics seems by contrast – but we have the former in the back of our minds anyway. There is some surprising re-ordering in the third act. For instance, ‘E Susanna non vien ... Dove sono’ after the Count’s aria came as quite a jolt. I assume the point to have been to place the Almavivas in closer dramatic counterpoint. In a fashion, it worked, but I am not sure that it was worth the upheaval; Mozart’s tonal planning is not lightly to be tossed aside. However, the production must be vigorously applauded for eschewing the wretched ‘traditional’ cuts in Act Four, permitting us to hear both Marcellina’s and Basilio’s arias. They are not simply ‘worth hearing’; they contribute immeasurably to Da Ponte’s construction of a battle between the sexes and place Figaro’s aria, which can otherwise seem to signal a somewhat bewildering change of focus, in context. Great Mozart conductors as well as poor ones have assented to the cuts; that does not make them any more palatable. Dominic Wheeler’s direction of the score surprised me too. I do not mean that personally; so far as I can recall, I have not heard him before. However, I have become so wearily resigned to present-day conductors having not the slightest understanding of Mozart, that to find one whose name is not Davis or Barenboim conducting so warmly sympathetic an account comes as a genuine surprise. Very little, if anything, was hard-driven. (One of the greatest problems, perhaps the greatest, we experience today is conductors who think that denying music space to breathe – and that does not by any means equate to crotchets per minute – is somehow ‘exciting’ or ‘dramatic’; it is of course quite the opposite.) Tempi were generally apt, only the Countess’s arias proving problematical, the first dragging – again, not a matter of speed, but of insufficient harmonic motion – and the second proving a little too rushed. More to the point, Mozart’s harmonic-dramatic development was for the most part ably communicated: no mean feat. If there were occasions when the orchestra – strings 8.7.5.4.2, quite adequate for a small theatre – lost momentum, none ultimately proved so very grievous, and there was much fine playing to be balanced against such lapses. There was, moreover, not really a weak link in the cast; every one of the Guildhall singers shone in one way or another. A slightly shaky start soon gave way to a vigorous performance from Ben McAteer as the Count. His Countess, Magdalena Molendowska, however unflattered by her costume in the third and fourth acts, showed considerable dignity in stage presence and in voice. Raphaela Papadakis proved a lively Susanna – without which any performance will fall flat. Catherine Backhouse was splendidly convincing as Cherubino in gawky female guise. Even if the coloratura of her aria sometimes proved a little much, Roisin Walsh offered a convincing Marcellina, at the very least matched by those taking the other ‘smaller’ roles, amongst whom I should single out Lauren Zolezzi’s beautifully sung Barbarina. The greatest praise should, however, be offered to I due Figaro. No need to worry: I have not taken on an unaccountable tendresse towards Mercadante. An ailing Hadleigh Adams, however, ceded his arias to Joseph Padfield. I wondered whether he need have done, so convincing were both his stage presence and his handling of Mozart’s quicksilver lines; indeed, there seemed to be no need whatsoever to make allowances. Padfield, however, offered an equally convincing, slightly darker, assumption of the arias from the side of the stage. Both singers richly deserved their enthusiastic applause, as did the production as a whole.